People have been dreaming of flying cars since the very first day we realized that human flight was possible. We love cars, we love flying, we love traveling, and we love independence: all of those things are brought together in the idea of a car that we can fly or drive as the mood strikes us, and even take long journeys without the planning and expense of a commercial airline flight. Various forms of flying cars have been developed over the last century, and some of them were nearly successful. Don’t think that this is a forgotten dream, though – plenty of people would still like to see us all in Jetsons cars, and they may just get their way eventually. What follows isn’t an exhaustive list of every flying car ever designed – it’s an examination of where the idea began and where it may be headed. 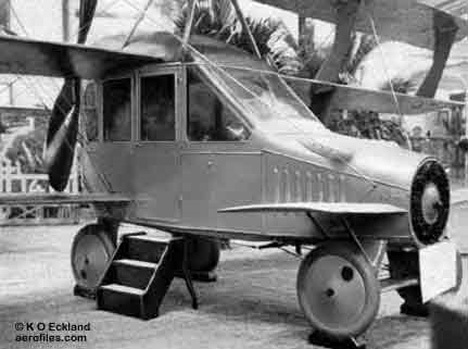 The very first working flying car prototype was built in 1917 by Glenn Curtiss. 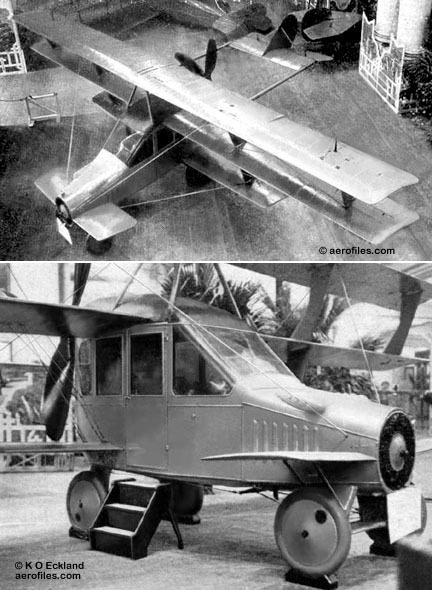 The Autoplane was a small craft at only 27 feet long, and could only carry a payload of 710 pounds. But the car with wings was an exciting development at the time, and Curtiss believed that it would soon become the personal transportation of everyone who could afford it. Sadly, the Autoplane never achieved sustained flight. It made a few hops, but it was destined to go down in history as the flying car that never really flew. In 1933, the U.S. Air Commerce Bureau put a call out to aircraft designers to create an airplane design that would cost less than $700. The Flivver competition, as it was called, produced a few flying car designs. Among them was the Aerobile from Waldo Waterman. 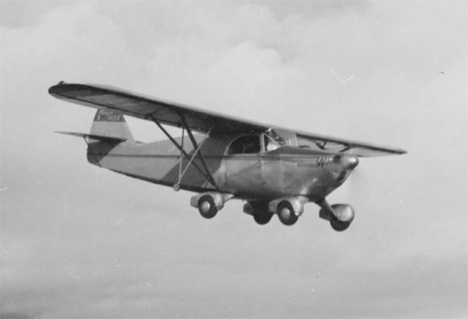 The curious vehicle looked and performed more like a car than its predecessor, with a Studebaker engine under the hood and a steering wheel in the cockpit. Unfortunately, being introduced in the middle of the Great Depression proved an insurmountable obstacle for the Aerobile; even though it was able to fly, it never caught on. Waldo Waterman continued to work on and improve the design, but it never gained flight certification or went into mass production. The next contender in the flying cars race was the Airphibian, designed by American inventor Robert Edison Fulton, Jr. in 1945. Fulton, a relative of steamboat inventor Robert Fulton, the Airphibian was the first flying car to get a conditional flight certification from the Civil Aviation Authority in 1950. It featured removable wings and tail, which Fulton boasted could be removed by just one person. The design, however, ran into the same troubles as most other flying cars: the heavy materials and technical requirements meant that it was clumsy in the air and sluggish on the ground. Although the design was technically successful, the company itself fell victim to financial woes and the Airphibian never went into production. 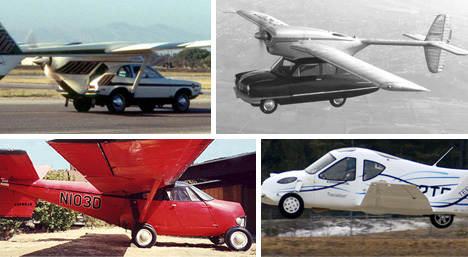 If you think the other flying cars all look a little too much like airplanes, join the club. 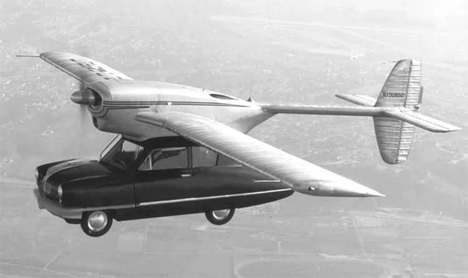 Industrial Designer Henry Dreyfuss decided to design an actual flying car in 1947, and the Convaircar was the result. It was, quite literally, a car that could fly. The car itself sported a lightweight fiberglass body and could seat four. The wings and engine/propeller snapped onto the top of the car, and when not in use were towed behind the car. The idea was well-received until the vehicle crashed during a test flight, killing the pilot/driver and scaring potential investors (and prospective customers) off. 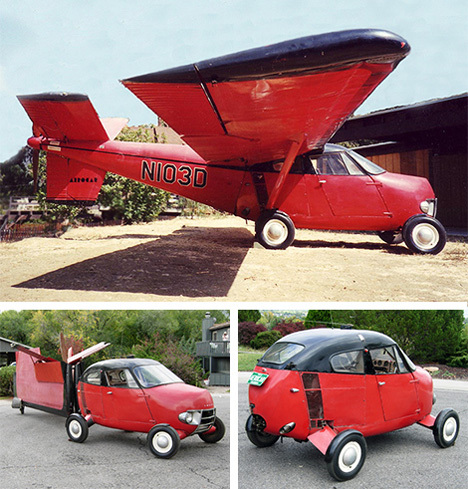 Molt Taylor’s Aerocar design is arguably the most famous of them all. Taylor was intrigued by the idea of flying cars, and he paid a visit to Robert Fulton, Jr., inventor of the Airphibian. Taylor believed that he could improve on the idea, so he set to work designing a roadable airplane/flying car that featured folding wings attached to a removable tail section. The Aerocar was made into a reality in 1949, and eventually six models were built. The design received CAA (what is now FAA) certification in 1956 and Taylor struck a deal for mass production. However, the deal came with the condition that at least 500 advance orders would have to be in place before production would begin; when Taylor couldn’t achieve that goal, the deal was scrapped. One of the original Aerocars, amazingly enough, is still flying. Anyone who has ever driven a Ford Pinto can attest to the safety problems inherent in the car’s design. 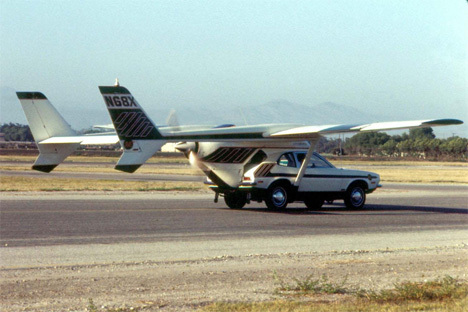 Seemingly unworried by that, an Oxnard, California company called Advanced Vehicle Engineers (or AVE) designed this bizarre hybrid consisting of a Ford Pinto with a removable flight assembly taken from a Cessna Skymaster. Built between 1971 and 1973, the Mizar was scheduled to go into production in 1974. AVE predicted that anyone would be able to buy their own flying car for as little as $18,300. Unfortunately, during a test flight on September 11, 1973, the right wing strut gave out during a flight test and the vehicle crashed, killing its inventor, Henry Smolinski, and the pilot, Harold Blake. Poor construction and faulty welds were blamed for the tragedy. Dr. Paul Moller has been working on his flying car design since 1962. It’s his goal to develop a safe roadable airplane that can also take-off and land vertically. It turns out this is even more challenging than it sounds, since Moller International has been at it for nearly 40 years. 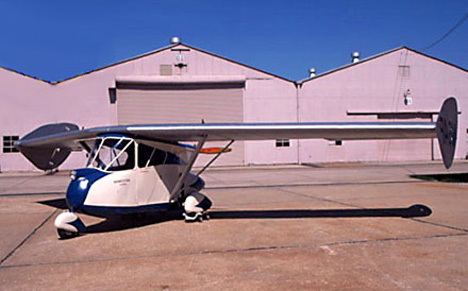 One model of the Skycar has successfully completed over 200 test flights since 1989. Their M400 Skycar, the latest model, is completely computer-controlled, so the pilot only has to decide which direction to move the controls in. The design wouldn’t replace a family car for everyday or long-distance driving, but it can to from flying to driving almost effortlessly. 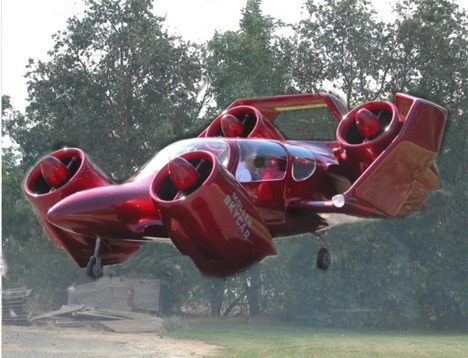 Terrafugia is a newcomer to the world of flying cars, but their completed proof of concept vehicle looks immensely promising. Founded in 2006 by MIT engineers and MBAs, the company aims to deliver its first products to consumers in 2011. Their design, dubbed Transition, is decidedly modern, but vaguely reminiscent of the Aerocar. 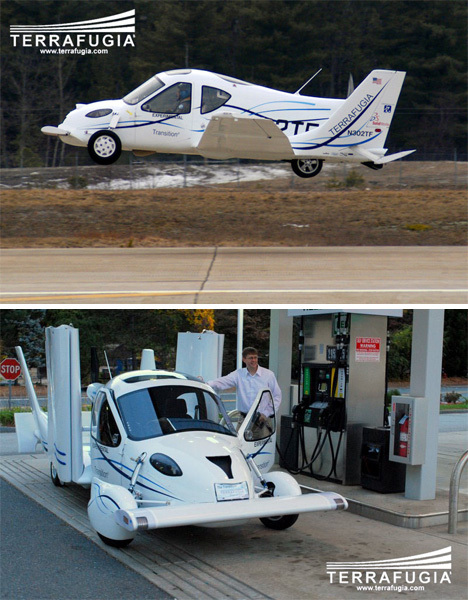 The wings are folded and unfolded from inside the cockpit, two people can fit inside, and when on the ground the vehicle gets about 30 miles to the gallon. Only time will tell if the Transition ever takes off, so to speak, but so far it looks promising. While flying cars have been little more than a dream for the last century, factors may be aligning that will finally allow the idea to flourish. The main obstacles to flying cars have typically been the weight of the materials, the ease of control, and the lack of infrastructure to support millions of cars zipping around in the air. Due to new, lighter, stronger materials, the concerns about weight have largely been eliminated. And due to computer systems which can automate a large part of the flight, that concern may soon be a thing of the past. But still, there is no established infrastructure to allow everyone to fly rather than drive. For the time being, treating flying cars as airplanes that can also drive seems to be the solution. Pilots will still require special licenses to drive them, and the vehicles will be subject to the same FAA regulations as light aircraft. So will we be flying to work anytime soon? It’s not likely. But with a little luck and some additional development, future fishing trips or holiday visits will be made simpler when we can just load the family up and drive, fly, then drive again to our destinations.